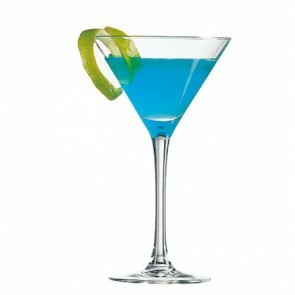 Choose the fashionable martini glass if you want to serve to your favorite appetizer liquor with elegance. 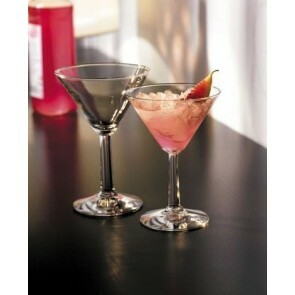 Martini glasses are a definitely must drinkware and stemware item! A true must-have bar accessory, this transparent glass is known to be the first cocktail glass. 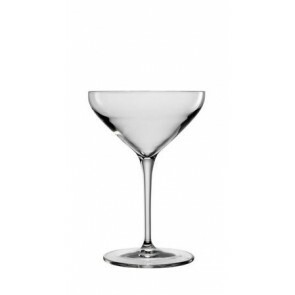 Designed in the 19th century, martini glass is a transparent stemmed glass with a distinctive shape. Its conical shape prevents the warming of the drink when in contact with your hands. You can both enjoy your drink and the scent of the cocktail. 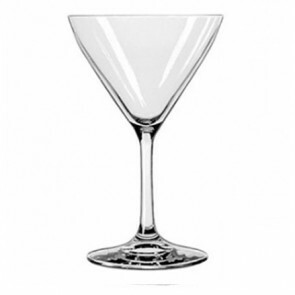 If before the martini glass was as popular among men than women, today they are mostly popular among women since holding a martini glass is synonymous with class and elegance. Nowadays, martini glass is very popular in popular culture and is found everywhere and they can often be spotted in Hollywood movies. Some famous people like Winston Churchill or Ernest Hemingway and Arthur Conan Doyle's famous James Bond character, often sport a martini glass, their favorite glass! With its huge success in the catering industry, you will certainly find it behind the counter of a trendy bars or sometimes offered used as an appetizer glass in restaurants. The chic appeal of this stemmed glass is timeless! 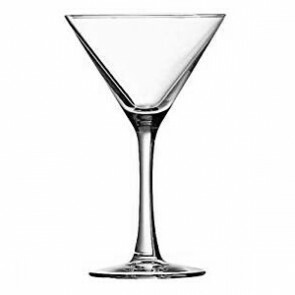 Whether made of glass or of crystal, martini glasses are often a favorite alcohol glass to enjoy a cocktail or an appetizer. 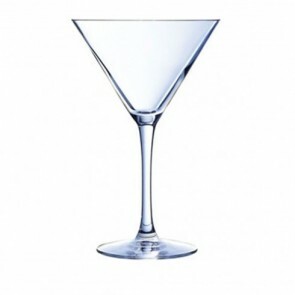 The shape of the martini glass is also sure to please your guests at formal gatherings or casual parties. 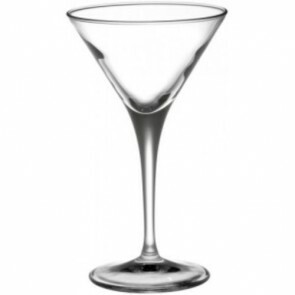 The martini glass is ideal for tasting your martini cocktails which are very strong in alcohol thanks to its small capacity. Dry martini, is the most famous. 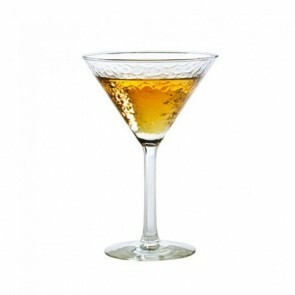 This cocktail is made of gin and dry white vermouth and can be served without ice or with crushed ice or with green olive. Not to mention the iconic Cosmopolitan, a cocktail composed of vodka, triple sec, lime and cranberry juice that gives it its pink color. Or the famous Daiquiri made with rum, lime juice and sugar. 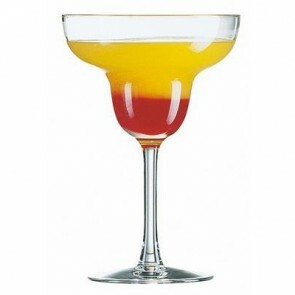 It can also be used as Margarita glass, tequila-based cocktail or Mojito glass (again rum!). You can very well use it as a shot glass to serve your digestive after the meal. 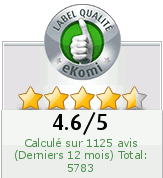 Our martini glass is part of our selection of appetizer and cocktail glass, among which you will find the pastis glass, beer glass, longdrink glass. Use the transparency of this sophisticated glass to impress your guests and play with colors and shapes. Concoct visually attractive cocktails, play with layers of colors and cocktail accessories to dress up your glass (straw, coasters, decoration spades). Put a multitude of different cocktails in your martini glasses on a large banquet table to impress your guests during your receptions! The martini glass is stackable. Make a pyramid cocktail for your wedding, birthday table, or Christmas table in martini glasses (as an alternative to the traditional champagne flutes), it is sure to hit the mark with your guests. 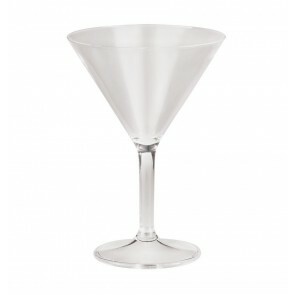 Decorate the centerpiece of your wedding reception with the Martini glasses that you will use as coated containers! 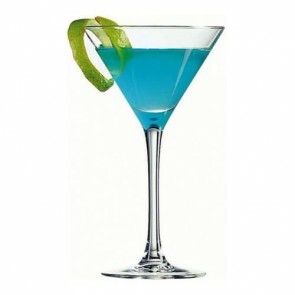 Find a whole array of martini glasses of famous brands on AZ Boutique including polycarbonate plastic martini glasses. They will be the ultimate accessory to enjoy a Manhattan cocktail, dirty martini, a cosmopolitan cocktail, a Brandy Alexander or just a classic martini. Our glassware collection also includes other elegant items such as margarita glasses, whisky glasses, wine glasses, old fashioned glasses, and pilsner glasses among others.